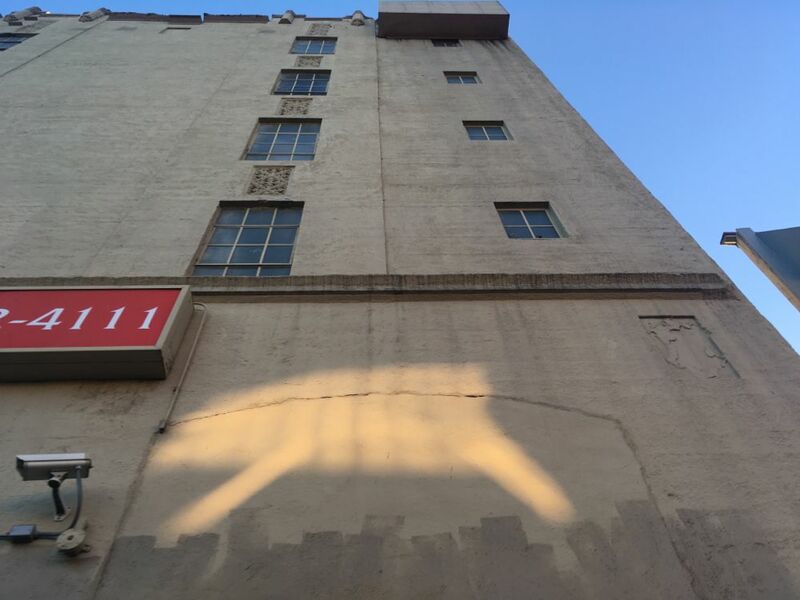 As the sun sets each summer evening, it sends a shimmering pig up the side of a tall storage building down the street. 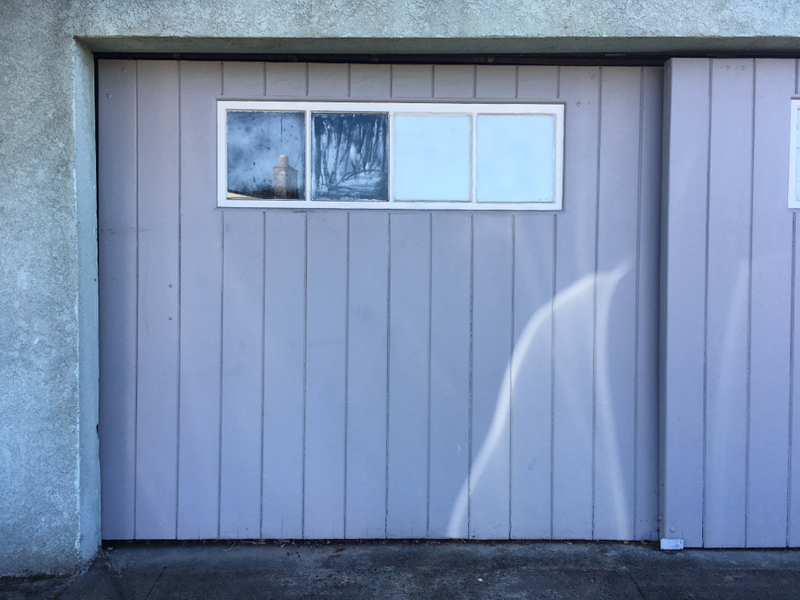 At first, the pig looks like it’s standing on the sidewalk, then it ascends the wall and fades as the sun disappears. Brian noticed and identified it a few years ago. I still remember him standing at the window of our apartment, repeating the phrase “Shine Pig” until I came to look. 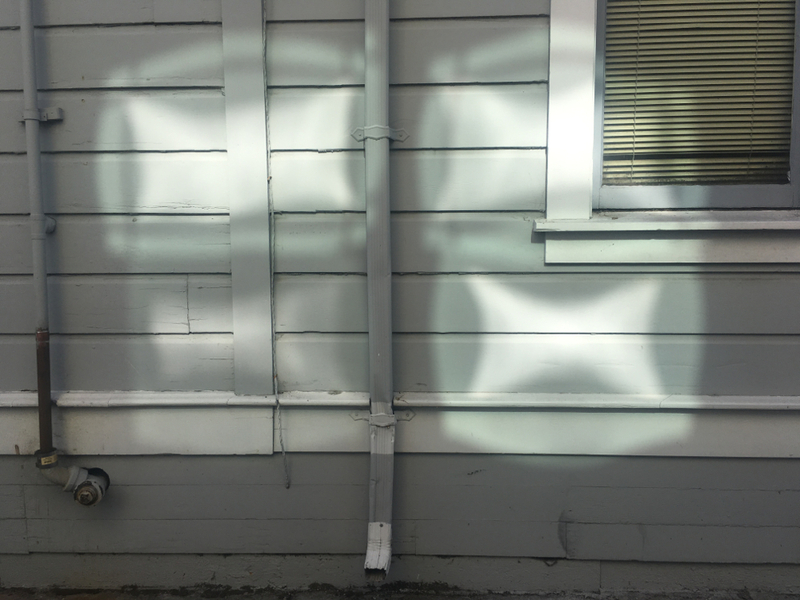 Shine Pig is created by the sun’s reflection in a second-story window across the street, where something mysterious creates the shape of a pig. I didn’t notice how common “Shines” were until, inspired by Shine Pig, I began walking around deliberately looking for, photographing, and examining them. They’re more golden than nearby sunbeams, and their edges are extremely soft. A Shine needs four things to exist: sun, a reflective surface, a flat surface to be projected onto, and a shadow. 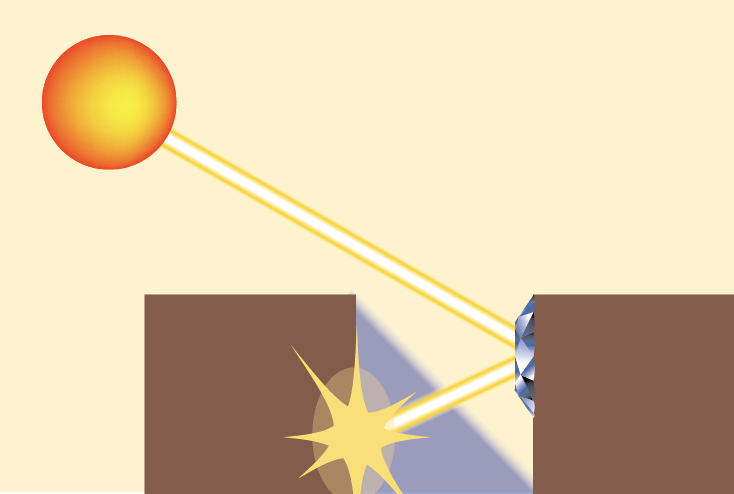 Some potentially very good Shines are broken up by uneven surfaces, or disappear into the air because there are no shaded walls for them to land on. Different times of the day bring up different conditions where sun and shade mix to create Shines. 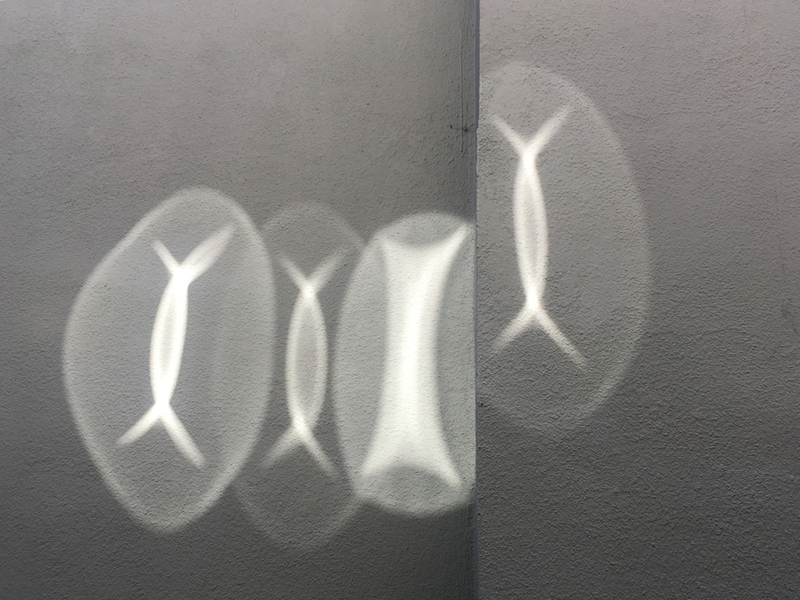 At mid-morning and mid-afternoon, large Shines appear between houses: sunlight hits an upper window and reflects onto the wall of the house next door. Schematic diagram of the sun, reflective surface, shadow, and projection surface required to create a shine between two buildings. Even at noon, smaller Shines are common on sidewalks along parked cars. 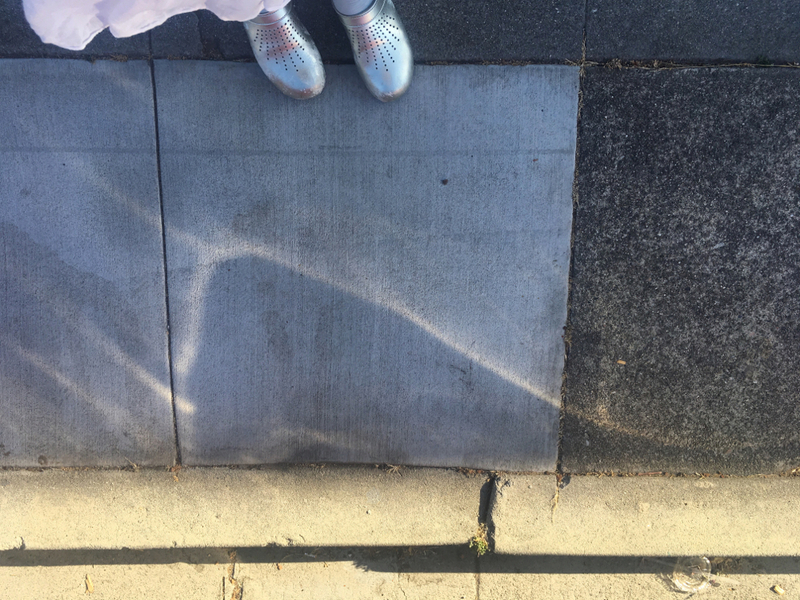 They happen when the car is in sunlight but the sidewalk is in shadow. 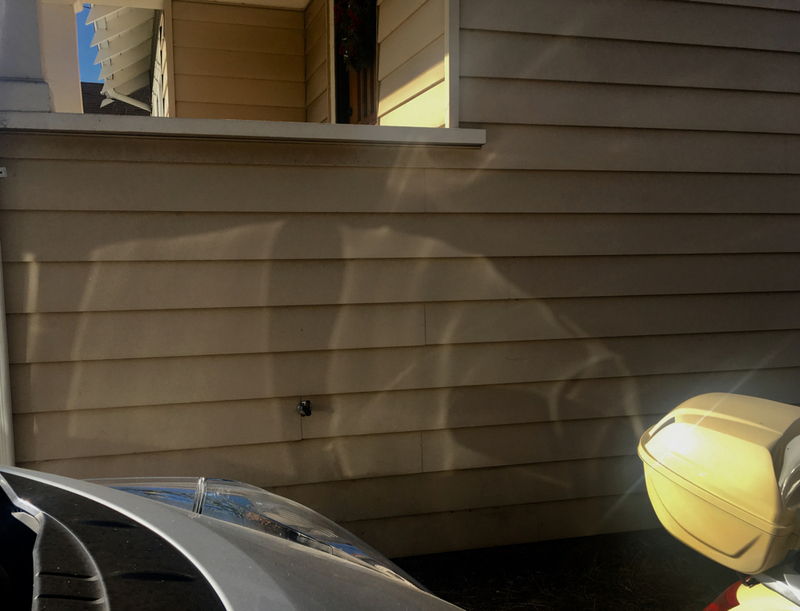 This scooter next to a house can create a Shine Buffalo. But if that same scooter was at the curb, the buffalo would have nowhere to land and would totally disappear. Near sunset, only the tallest buildings are still illuminated. The Shines they project take on an orange glow. The ancient world, and today’s rural landscapes, had and have reflective surfaces like ice, water, and volcanic rock. But dense urban areas, with their shifting rows of cars and walls of windows, are what allows such a large number of beautiful shines to emerge. 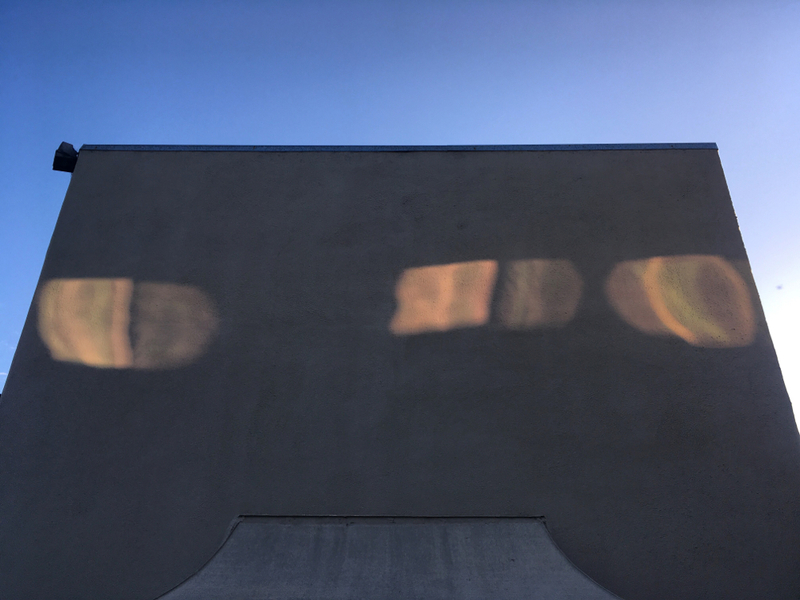 I began to turn the camera around and photograph the reflective source of each shine: the blinding sun spot as it bounced off of windows, mirrors, and hubcaps. Even though Shines aren’t totally real, there is something alive about the way they appear, disappear, and slowly travel across the landscape. Shines are, literally, beings of light. A friend wrote in an Instagram comment on the photo below: “These resemble my idea of what a soul could look like”. Shines are scattered around our cityscapes like gemstones waiting to be discovered: messages from the sun, our own personal star who is speaking to us in the language of pictures, of spirit-like animals moving across the walls.